The stone for the Confederate Monument in Oakwoods Cemetery, Chicago, was quarried and cut at the Southern Granite Co. works in Lithonia, Georgia. Chicago, Illinois - Rosehill Cemetery - the Façade (The following information is from “Ghosts of History Live in Rosehill Cemetery,” by Karen Kruse, in the AGS Quarterly, Bulletin of the Association for Gravestone Studies, Vol. 32, No. 1 & 2, Winter & Spring 2008, pp. 9-11. According to this article, the castle-like façade located at the entrance to Rosehill Cemetery was constructed from Joliet limestone. William W. Boyington (1818-1898), architect, designed the structure. The “castle entrance” was erected in 1864. Rosehill Cemetery in Chicago, Illinois, was established in 1859. According to the web site, Swen Parson Library was open for use in 1952, and Illinois limestone was used in the construction of the exterior. Today the building is known as the Swen Parson Hall. Evanston (near), Illinois - the James Roscoe Miller Campus AKA the “Lakefill” Campus - of the Northwestern University, presented on the Northwest University. Grafton, Illinois - the Illinois Youth Center Pere Marquette, previously known as the Harry Hill Ferguson Estate and the Pere Marquette Boys’ Camp, presented by the Illinois Department of Corrections. 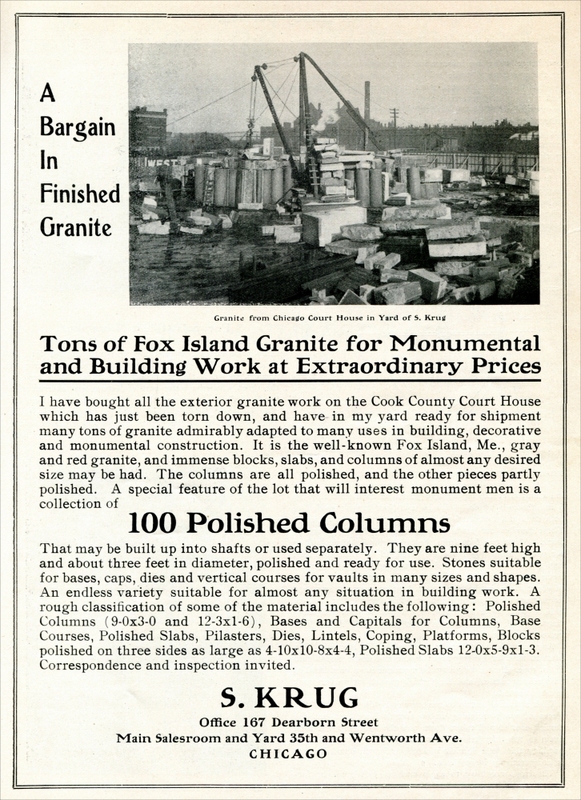 In the 1920s and 1930s, Harry Hill Ferguson, an Alton industrialist, “purchased limestone blocks from the local Grafton quarries and small portions from an old trading posts.” He imported stonemasons from Europe and Yugoslavia to do the stonework on his estate. Limestone was used in the construction of the buildings on Mr. Ferguson’s estate. Mr. Ferguson willed his farm to the State of Illinois, and in March 1963 the facility opened as the Pere Marquette Boys' Camp, and in 1973 was organized as a residential center. As of June 1981 it became known as the Illinois Youth Center - Pere Marquette. The Campbell/Strong home was built between about 1845 and the late 1850s. 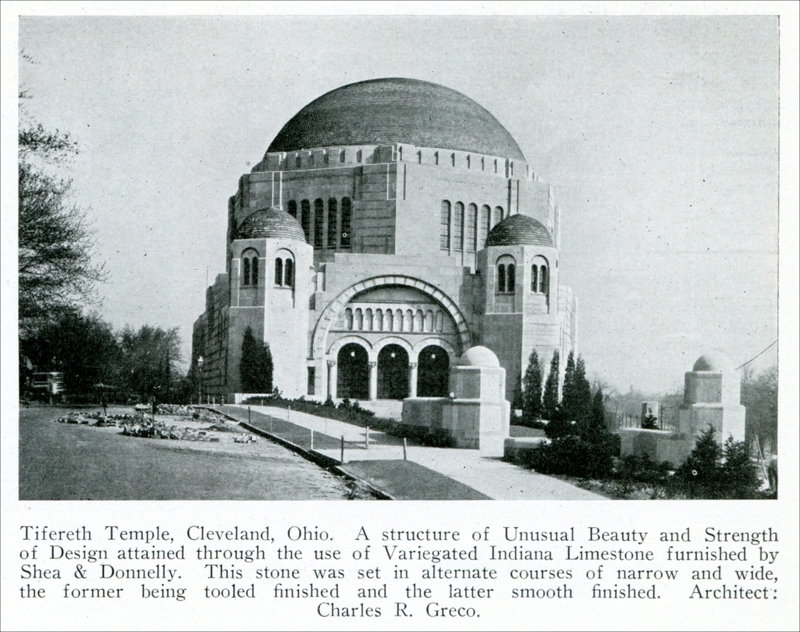 It is constructed primarily of Joliet limestone quarried in the area. According to this web site, the present courthouse is the third courthouse for Morgan County, which was completed in 1869. Limestone from Joliet area quarries provided the stone for the exterior of the courthouse, which was designed in the French Renaissance style. The Dorn home was built in 1929. It is constructed of Joliet limestone quarried in the area. The Gem Theater is constructed of brick and Joliet limestone quarried in the area. The Joliet Steel Works building was built 1891. It is constructed of Joliet limestone quarried in the area. The Max Goldberg home was built between about 1845 and the late 1850s. It is constructed primarily of Joliet limestone quarried in the area. "History - The City of Joliet was founded in 1831 by settlers who were attracted to the area by abundant fertile soil and soft coal and limestone deposits. The geography of the area was marked by bluffs to the west of the Des Plaines River Valley, at the time well-timbered, and by gently rolling prairie. "An important industrial resource of earliest Joliet that has continued to the present is the vast beds of limestone that underlie the city and surrounding area. Buildings constructed during the 19th century of local limestone still stand in many areas of the city, with several excellent examples contained in the proposed district (#'s 3, 10, 30, 37, 44). Chicago's historic Water Tower was constructed of Joliet limestone as was the Old State Capitol in Springfield." The Jacob A. Henry mansion is listed on the National Register. Construction of the mansion began in 1873 and was completed in 1876. Limestone from Mr. Henry's Joliet quarry was used for the foundation and basement floor. Red Illinois sandstone and red brick, fired in Ohio, were used in the next two floors. Single slabs of limestone were used for the porches, and the largest limestone slab every quarried in Joliet was used under the entrance gates. According to this web site, the stone measures 22 feet by 9 feet by 20 inches. The Patrick Haley home was built in 1891. It is constructed of Joliet limestone quarried in the area. The John Scheuber home was built about 1850. It is constructed of Joliet limestone quarried in the area. The Wagner home was built in the early 1850s. It is constructed of Joliet limestone quarried in the area. It is noted that the original owner was a stone cutter who worked in the area. This article presents the history of Joliet Prison, which was built with Joliet limestone using the labor of the prisoners. Lemont, Illinois - The Story of the Old Stone Church (photograph and history), presented by the Lemont Area Historical Society. The stone church was originally constructed with Lemont Limestone tailings from the Brown Quarry, located on the west side of town. Lemont, Illinois - the old School and other structures built of Lemont Limestone - the SS. Cyril and Methodius Parish. This site is presented by the SS. Cyril and Methodius Parish. It describes the history of the parish and includes many photographs including one of the rebuilt school. There is also some information about the limestone quarries near the town in which the local men worked. This is an account of Maeystown. There are several buildings remaining constructed of limestone. Nauvoo, Illinois - the Navoo Illinois Temple of the Church of Jesus Christ of the Latter Day Saints. Stone quarried from the Nauvoo Limestone Quarry was used in the construction of the Nauvoo Illinois Temple in Nauvoo, Illinois. (The link from which this information was obtained in no longer available. This site was presented by JP&G Enterprises.) Click here to view "Nauvoo will be forever changed by the Temple getting rebuilt," by Norm Winick, presented on The Zephyr.com web site. 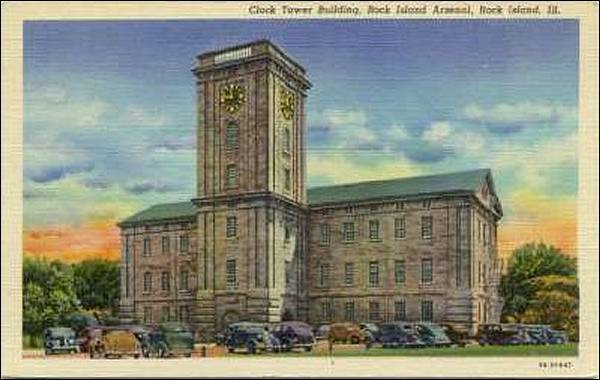 Rock Island, Illinois - the Clock Tower Building, Rock Island Arsenal, Rock Island Ill. (colorized postcard photograph, #9A-H1647; published by Curteich; unmailed; the building was constructed with limestone quarried in LeClaire, Iowa. (colorized postcard photograph, #9A-H1647; published by Curteich; unmailed; the building was constructed with limestone quarried in LeClaire, Iowa. Rock Island, Illinois - Augustana College - Old Main (picture and history). This site is presented by Erwin Weber. The Old Main building was partially completed in 1888. Sandstone quarried in Le Claire, Iowa, was used in theconstruction of the exterior of the building. Springfield, Illinois - the Illinois Statehouse, information presented by Legends of America. The web site states that the limestone quarried at Romeoville was used in the construction of the Idaho Statehouse. Finished Products of Stone from Illinois in Washington, D.C.
Washington, D.C. – the Illinois Memorial Stone, the Masons Grand Lodge of Illinois Memorial Stone, & the S. of T. (Sons of Temperance), Grand Division of Illinois Memorial Stone contributed to the Washington Monument (photograph and history), presented by the National Park Service. The information below is from the National Park Service files and is presented with a photograph of the contributed Illinois stones. The Illinois Memorial Stone in the Washington Monument can be viewed along with the details in the WAMO Stones Section 2. The Masons, Grand Lodge of Illinois, Memorial Stone can be viewed along with the details in the WAMO Stones Section 3. The S. of T., (Sons of Temperance) Grand Division of Illinois Memorial Stone can be viewed along with the details in the WAMO Stones Section 4. The following information relating to the Illinois Memorial Stone can be viewed along with the details in the WAMO Stones Section 2. Original inscription: Illinois. State Sovereignty: National Union. The Masons, Grand Lodge of Illinois, Memorial Stone in the Washington Monument can be viewed along with the details in the WAMO Stones Section 3. The S. of T. (Sons of Temperance), Grand Division of Illinois Memorial Stone can be viewed along with the details in the WAMO Stones Section 4. Dimensions: 3' 1" x 4' 6"